The content is structured by year beginning in 1972. There at 7-10 pages for each year. 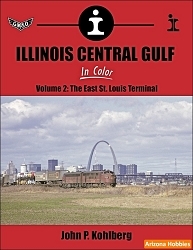 You will see predecessor locomotive paint schemes, experimental paint schemes, shops, viaducts and the photographic coverage is of both former Illinois Central and Gulf, Mobile & Ohio routes. Most photographs are taken between Chicago and Memphis. 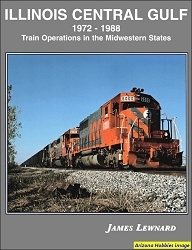 This first in a series of Illinois Central Gulf In Color books starts at the merger in August 1972 and continues across the system until the end in early 1988. Included are rare shots of the Bi-Modal Roadrailer operation; locomotives, freight cars, and cabooses in fresh orange paint; action, structures, signals, shops, yards, junctions, and people from across the system.